Welcome to this week's edition of the Wednesday Hodgepodge. To play along just answer the questions on your own blog then add your link to the bottom of my post. Afterwards hop around and see what your neighbors are saying. Remember there will not be a Hodgepodge next Wednesday (July 4th)...July 11th will be the next 'official' Hodgepodge. Yes, the weekly Hodgepodge is official. Guess I'm a dictator when it comes to Wednesdays. 1. What do the words 'freedom' and 'liberty' mean to you? Does your mind go in the direction of not being persecuted or discriminated against or does it head in the direction of doing what you please? I'm not sure there is ever a time in our lives when we can do whatever we please...all actions have consequences. As Americans we certainly have more freedoms than most. We can say what we want, worship or not, defend ourselves, protest, receive fair treatment when accused, and in essence write, think, speak and act without fear of reprisal so long as we stay within the very wide parameters of our law. Mostly when I think of freedom I think of the cost and I feel grateful. 2. Nathan's sponsors a hot dog eating contest every July 4th. Last year over 40,000 people attended the event and almost 2 million watched it on TV. The winner ate over 60 hot dogs and buns in 10 minutes. How do you like your hot dogs? It's a little bit obnoxious how much I love watermelon. When I was pregnant with daughter1 that was my craving. I'm pretty sure I ate a whole watermelon on my own on more than one occasion the month before she was born. I don't do that anymore. I could, but I don't. My girls have their own apartments now so it's just the hubs and I here at the old homestead. We pretty much discuss everything, which feels very democratic. Thinking back to daughters in the house I'd say we ran a benevolent dictatorship. In establishing rules and making decisions that would impact all family members we always came from a place of love as opposed to power, which I think differentiates us from a true dictatorship. We listened and were willing to adjust rules when circumstances warranted. Children and teenagers have opinions and those opinions need to be expressed and considered, but when push came to shove we never rejected a move/job promotion because a kid voted no. I think God gave us parents for a reason. 5. Where was your favorite summer place as a kid? I'd probably say our local swim club. We spent every afternoon there in the summertime and it was close enough for my sister and I to ride our bikes once we got old enough to go without a parent. There were four kids in my family and we didn't take a vacation every year or even most years. If we did it was out west to visit our grandparents, one set in Colorado and one set in New Mexico. I loved those trips and time with family. Flying was very exciting (remember that?!) and the scenery and sites so very different than what we knew on the East Coast. I think I might write about that one day soon. See #4. I have three empty bedrooms most of the time. My girls each claim a room as their own but they go unused most of the time. Boo. The third room is a designated guest room and yes I'd sleep there. I'd sleep in any of my bedrooms. We normally do our local small town parade and watch the water ski show on our village lake. We cook out and go back to the lake in the evening to watch fireworks. This year we'll be doing something a little bit different and celebrating with my siblings. My brother is having a bbq/pool party and we're going to that. His town has fireworks over the river and coincidentally he lives on the river so great viewing. I've pinned several red, white, and blue treats on Pinterest and will be making this trifle to take to the party. Both of my sisters and their families will be there too so I'm looking forward to that. "Proclaim liberty throughout all the land unto all the inhabitants thereof." Your answers are always so thoughtfully written, Joyce! 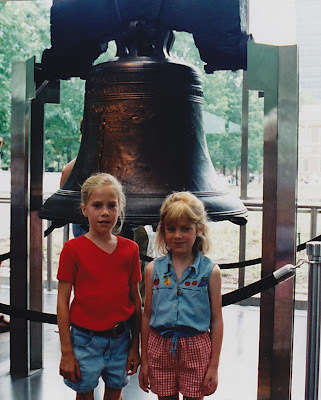 Love that picture of your girls with the Liberty Bell and the verse beneath it. Thanks for hosting this meme each week! Happy 4th to you! My mother ate so much watermelon when pregnant with me that she retained water and swelled like crazy. Fun fact. oh sweet pictures of your daughters! I definitely miss those years. I know you do too! You must have read my mind - I was just thinking about how much I want a watermelon! It's a very humid day in London. Love the pictures of your daughters in front of the bell...so cute. Sounds like you have some fun plans for the 4th. I'm not sure what we're going to do yet. Yeah for watermelon. Great verse with picture. Watermelon would be a great contest to get in on. I love it, too! And, like you I craved it while I was pregnant with all three of mine. In fact, I'm the only one who eats it pretty much because everyone else has a slight allergy to it. Eating watermelon use to bother my throat when I was a kid, but it never stopped me from enjoying it. Thanks for hosting! You can tell summer is here with the slow link up. I thought I'd be way down on the list today, but I'm not! Tuesday & Wednesday Blog Hop Mash! Love your freedom response...that is 'right on' perfection!!! AND...this I CAN'T BELIEVE!!! !----------I too craved watermelon when pg with my daughter. In October no less. While I'm here, since there will be no Hodgepodge next week, wanna wish you and your loved ones a great holiday!! Love the picture of the cuties in front of the Liberty Bell. I will check out your Pinterest board. I am looking for some fun ideas for the Fourth! Enjoy your holiday! What a cute picture of the girls!! :-) And I think all young families should have your answer to #4 on a plaque on their kitchen wall. HAHA. One at a time. That made me chuckle. Love your answers and your watermelon answer made me smile. When I was expecting my daughter, kat I wanted peaches from Chilton Co. Alabama. It was spring and the peaches were not ready...when they finally were she had already made me appearance. I married my husband only five years ago, and I was delighted to learn he is peculiar in one way...he loves to cut fruit. So in the summer we often have a large container of cut up watermelon. Yum! Come on over! The picture of the girls is adorable. There have been so many cute 4th of July goodies on Pinterest. Sounds like a perfect way to celebrate with your siblings. Have a wonderful time Joyce. I love fireworks! I craved watermelon with my first child, and she always loved eating it, too! Great questions again this week, thanks! Love that picture of your girls in front of the Liberty Bell. Love the picture of the girls. I'm just starting to scan some of my old pictures. Its great to know you better! I agree about the water mellon eating contest. I would do that one for sure. And when I was a kid the swimming pool at the high school was our local favorite place to be too. I so love hot dogs! But not enough to eat them like they do in the contest. Happily, I will eat one at a time. have you seen the new version of watermelon margeritas...cut watermelon in small wedges, soak in jose cuervo gold tequila, sprinkle with sea salt before serving...yum! I love the Liberty Bell photo in honor of the 4th! Cute, classic! Hello! Happy early Fourth of July to you! Anyway your older daughter looks like she's about the same age as me, i was born in '84. I noticed the date & i was 14 that year. Anyway what are you doing for this years 4th of July? For some reason they always hold the fireworks display in this town on the 3rd. Watermelon is not my favorite. Maybe cuz I don't really care for water. Hahaha. I crack myself up. Have you de-personalized your girls rooms or are they as they left them? A friend of mine just had a baby and named her Liberty Belle. What do you think of that? Love the picture at the end, they were the cutest! Enjoyed your answers as always! Hope you have a wonderful 4th!